Ever heard of Ban'ei or hobbyhorsing? We didn't think so. Learn everything you need to know about these and three other extraordinary horse sports. Here in Saratoga Springs, our options for viewing (or participating in) horse sports are pretty much limited to polo, equestrian and, of course, Thoroughbred and harness racing. They’re certainly great options: Who doesn’t love a day at the races or a night tailgating at Saratoga Polo Association? I know I do. But this is a big world, and horses can do much more than just run around a track, field or course. Here are five horse sports from around the globe that, if brought to Saratoga, might just surprise even the experts in this horse-loving town. Maybe. Well…maybe not. Galloping full-speed on horseback isn’t exactly the most delicate way to get from here to there. So when a rider successfully spears a loop the size of a wedding ring hanging on a string between two posts with a stick the size of a pencil, all while mid-gallop (talk about threading the needle! ), it’s an impressive feat. The sport is called corrida de sortija, or “ring run,” and it’s played by gauchos—basically, cowboys—in eastern South America. Every Sunday at Feria de Mataderos, a fairground just outside Buenos Aires, locals gather to eat barbecue, dance and marvel at the incredible precision sport. Think traditional horse racing, but much slower. Ban’ei, a sport practiced exclusively at the Obihiro Racecourse on Hokkaido, Japan’s second largest island, involves draft horses pulling sleds weighing up to one ton, carrying jockeys over sandy hills. The sleds serve as handicaps, so younger horses and mares pull a lighter weight than older horses and stallions. Unlike racing Thoroughbreds, the draft horses are valued not only for their speed, but also for their strength. I get tired just thinking about it. Pretend you’re waterskiing—except that instead of water, you’re on snow, and instead of a boat pulling you, it’s a horse. Oh, and you have to collect rings, and ski through gates and off jumps. 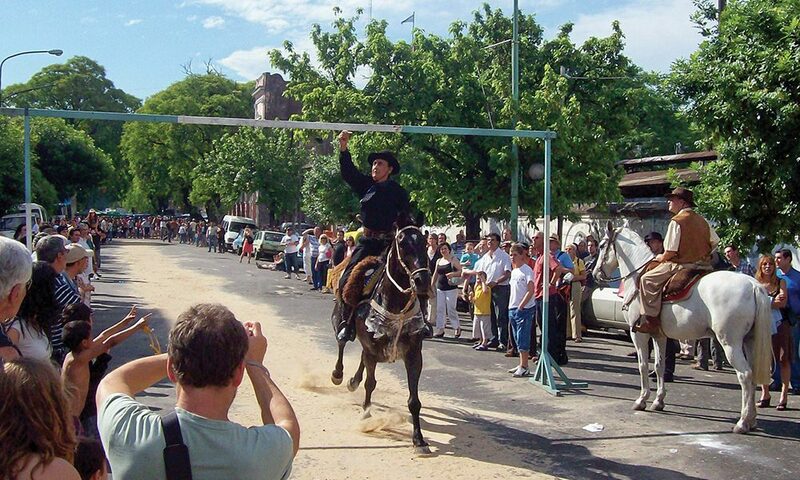 This is equine Ski Joring, a variation of skijoring, which also includes skiers being pulled by dogs or motor vehicles. According to Powder magazine, the sport originated among Scandinavian hunters who rightly found that being pulled by dogs was quicker than walking, and the equine variety debuted as a competitive sport is a demonstration event at the 1928 Winter Olympics in St. Moritz, Switzerland. Equine Ski Joring gained popularity in the US in the 1950s, first in Colorado, and now has its own governing body, Ski Joring America. 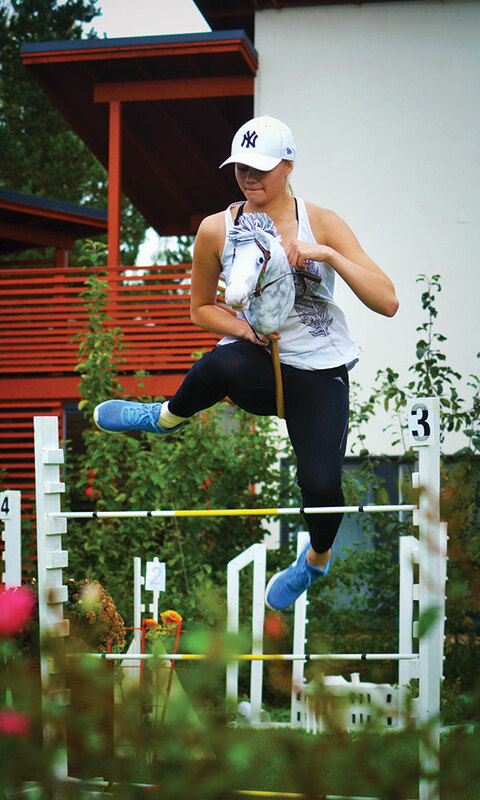 If I were a Finnish teenager, you’d find me at the hobbyhorse course. The sport—in which athletes participate in traditional equestrian events like dressage and show jumping, but with stick horses instead of actual horses (you read that right)—gained notoriety outside of Finland after the 2017 release of both the documentary, Hobbyhorse Revolution (you can stream it on Amazon’s Prime Video) and a video by the Associated Press of a hobbyhorsing competition went viral. “It’s very bizarre for other people to see, for the first time especially, this kind of stuff,” Taija Turkki, an 18-year-old hobbyhorse coach, told the AP. “Because [viewers] think we think the horse is alive, which we do not.” In fact, many hobbyhorses are homemade, and industrially made hobbyhorses are seen as “lower-caste” horses. Though the sport may look kind of silly, it’s reported to be therapeutic, and has apparently helped many girls overcome personal issues. As if gymnastics weren’t difficult enough, try doing it on horseback. Dzhigitovka, a style of trick riding originating in the Caucasus Mountains between the Black and the Caspian Seas, involves skilled riders standing up, doing headstands and jumping to the ground and then back on a horse—not to mention picking up small objects off the ground, all while the horse is full-on galloping. When Georgian trick riders came to the US to perform their skill in circuses and other shows in the late 1800s, the sport caught on and “trick riding had a boom from coast to coast,” says Frank E. Dean in the 1974 book The Complete Book of Trick and Fancy Riding. Recently, the sport and its horse-archery variety have gained popularity in the UK, which sends teams to The World Dzhigitovka Championships in Moscow.